A call to Claude Niek at CSO Yachts confirms that his central agency for sale, the 26.2m motor yacht Carrara, has been sold to a direct client. Carrara is an MCA compliant motor yacht, built in 2005 by Amercraft with naval architect Andrea Bacigalupo. The GRP-built 26.20m Amer 86 model superyacht was refitted in 2008 and can accommodate eight guests in one master, one VIP and two twin cabins. 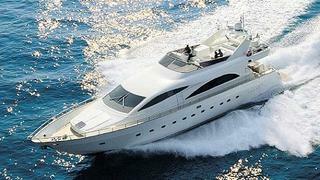 She has a range of 475 nautical miles at 25 knots and offers a maximum speed of 30 knots. Power comes from two 1570hp Caterpillar diesel engines. The asking price was €1.85 million.